The Blue Devil gymnastics team had a cinderella season by finishing first in the WIAC (Wisconsin Intercollegiate Athletic Conference) for the first time in over fifty years of University of Wisconsin-Stout having collegiate gymnastics. On March 23, the Lady Devils also finished second at the NCGA National Championship as a team with a school record of 192.275. The girls started the competition on the uneven bars where they went six for six and had the highest team score on the bars out of all the competing teams. They continued their momentum on the balance beam and posted a team score of a 47.675, the highest team score on the beam at the championship. UW-Stout was led by Mikala Bugge, Sierra Beaver, Chelsea Gray and Britney Wolfe, who all nailed their beam routines. The floor exercise presented some challenges and a couple of missed tumbling passes for the team. “This year was bigger than backflips, and their success really wasn’t about their gymnastics. It was 19 young women and two coaches that work hard, have grit, trust each other, trust their training and pay attention when called to do big things,” said Coach Beaulieu. Sophomore Cassie Ehmann mentioned that vault is the only team record the Blue Devils had yet to break this season and that was how the event finished. The team was determined and found a new fire going into the last rotation. All six gymnasts from UW-Stout nailed their vault from the lead off freshman Madison Latzke to the last vaulter of the entire competition Stout’s Shadae Boone. Shadae landed a vault that very few gymnasts in the country are able to compete successfully and set a new individual school record with a 9.825. This was enough for the Blue Devils to break the team vault record of 48.05 and re-break the total team record with a 192.275. Shadae became the second Stout gymnast to become the national champion on the vault. “Shadae is very much the team’s CEO – meaning she is their chief energy officer. She leads the Blue Devil gymnasts by leading dances or team activities, expressing her belief in them and being their vocal leader, so impressive to see out of a sophomore,” said Coach Beaulieu. 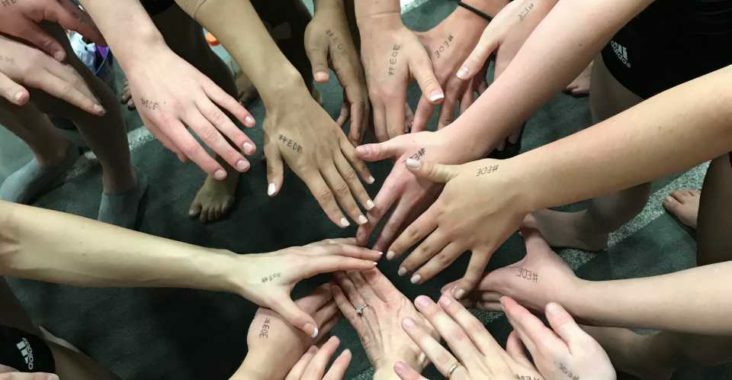 Sophomore gymnast Jackie Bertrand told the team their goal for the national championship was to “End on Empty,” so all the girls wrote #EOE on their hands during the meet to signify putting their everything into that day and the ladies of the Stout gymnastics team did not disappoint.